With his second release, West Coast-based saxophonist Anton Schwartz walks his tenor saxophone down the Slow Lane. Here, the Harvard and Stanford University graduate exhibits style, wit and a predilection for sublime, thoughtful phrasing amid a slightly hard edge, which counters any semblance of saccharine or smooth jazz ideologies. A nice blend indeed as Mr. Schwartz pursues the classics and a few nicely arranged originals augmented by a tight-knit ensemble who vividly demonstrate an acute awareness of Schwartz’ stylistic attack. Besides Schwartz’ shrewd articulation as a soloist, his comprehensive approach to each composition deserves a certain degree of praise. On Wayne Shorter’s “Miyako”, Schwartz doesn’t overwhelm yet digs deep within the fundamental aspects of this piece as though he is living the experience from a personal viewpoint via lush, sonorous lines with a well-balanced attitude! Here and throughout, Schwartz and his fine band make every note count. Schwartz pursues a dash of Bossa Nova along with fluid, breezy phrasing as the rhythm section maintains the undulating flow on the saxophonist’s composition, “The Curve of the Earth”. The saxophonist’s keen sense of melody and subdued yet well-stated style of execution continues onward, especially on Billy Strayhorn’s “Chelsea Bridge” as Schwartz’ husky tone melds nicely with the subtle and at times introspective blues lines on “Peace Dollar”. 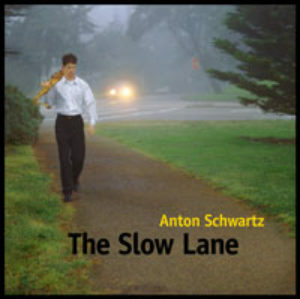 The title track, “The Slow Lane” is a soft even-tempered stab at Gospel-Blues featuring a crisp yet thoroughly soulful piano solo by Paul Nagel as Schwartz’ tenor work seems silvery or at times, quietly forceful. Track Listing: Miyako; The Curve of the Earth; Don’t Ask; Then Again; Along Came Betty; Chelsea Bridge; Come Rain or Come Shine; Peace Dollar; Born to be Blue; The Slow Lane; The Curve of the Earth (reprise).